ASPEN – There’s bound to be a lot more laughter and neighborhood activity at the city-developed Burlingame Ranch affordable housing project now that a $1 million park and playground is set to open. Although not yet named or completely finished, the park is scheduled to open this week, said Stephen Ellsperman, Aspen parks and open space director. Set on 2.65 acres, the park has two playground areas, designed for different age groups. There will be a large turf area and an intricately-designed stormwater system complete with a waterfall. A ditch system will flow into two ponds that are currently being dug out. When completed, stormwater will be cleaned through a filtering system and then flow directly into the ponds. Eventually, the water will empty into the Roaring Fork River. That element is just one aspect of the city’s attempt to connect the park to the natural landscape. There will be elevated view planes, native vegetation and picnic areas all over the site. “We’re not trying to plop a suburban park into this neighborhood,” Ellsperman said. The section that will open to the public this week is primarily the playground area. The park is located off Harmony Road, at the entrance to the neighborhood, located north of Highway 82 across from Buttermilk. Throughout the park, there’s massive alcoves, boulders, stairways and walkways for kids and their parents to entertain themselves. “We’ve spent so much time making sure it’s a place to explore,” Ellsperman said. 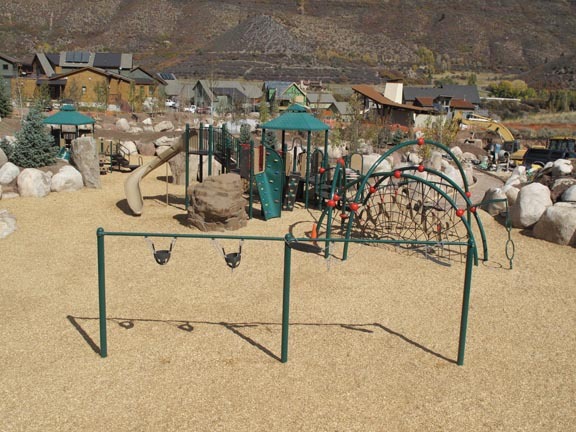 Provided by Rocky Mountain Recreation Inc., the “big” playground has multiple climbing and sliding opportunities, as well as a large swing set. It’s designed for children ages 5 through 12. The “tot” playground has some of the same elements the bigger kids will enjoy, as well as what’s called a “bobble rider” and a turning “saddle spinner.” It’s designed for kids 2-5 years old. The Aspen City Council hired Rocky Mountain Reaction Inc. this past summer to install the equipment. That work cost the city $122,800. The entire project is budgeted at $495,000. Of that, $100,000 comes from a Great Outdoors Colorado grant. Another $100,000 will come from the city’s asset management fund. The rest comes out of the parks’ department budget. “We’ve designed and built this park in house,” Ellsperman said. Known as “Lot C,” the land was acquired by the city in 2008 for $500,000. It was purchased from the Bar X subdivision and was originally zoned to be used for a cultural arts facility, which was the desired use by the Zoline family, the original property owners. The park is environmentally friendly as well. The equipment manufacturer, Landscape Structures, made the play structures mostly from recycled materials. The steel components are made from 45 percent recycled content and are 95 percent recyclable. The aluminum posts are made from 81 percent recycled content and also are recyclable, according to a memo to the Aspen City Council from Scott Chism, project manager. Landscape Structures is a partner of Global ReLeaf, a program of American Forests. For every playground that Landscape Structures sells, trees are planted through Global ReLeaf to offset the carbon dioxide produced while manufacturing that specific playground. The playground at Burlingame will create 12.06 tons of CO2, which will be offset by planting 38 trees.